The reference area, A, is defined as the area of the orthographic projection of the object on a plane perpendicular to the direction of motion. For hollow objects, the reference area may be significantly larger than the cross sectional area, but for non-hollow objects, it is exactly the same as a cross sectional area. As can be seen, the drag coefficient is primarily a function of the shape of the body and taking into account both skin friction and form drag. It may also depend on the Reynolds number and the surface roughness. 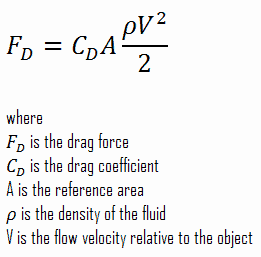 The drag coefficient is a common measure in automotive design. Drag coefficient, CD, is a commonly published rating of a car’s aerodynamic resistance, related to the shape of the car. 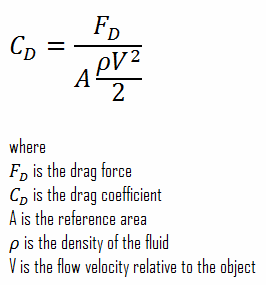 Multiplying CD by the car’s frontal area gives an index of total drag. The result is called drag area. Since aerodynamic drag and drag force increases with the square of velocity, this property becomes critically important at higher speeds. Reducing the drag coefficient in an automobile improves the performance of the vehicle as it pertains to speed and fuel efficiency. The average modern automobile achieves a drag coefficient of between CD = 0.30 and 0.35.